Hundreds of horses, trainers, exercise riders and grooms are busy on the Woodbine backstretch – only 11 days until opening day! At left, Ian Black leading out one of his charges yesterday morning. Photo by Dave Landry. Watch and wager on the huge Dubai card Saturday morning, HPI TV, 9:40 a.m.
Frankie Dettori is hoping his decision to opt for Two Step Salsa over stablemate Gayego will pay off in Saturday’s Godolphin Mile at Nad Al Sheba. Twelve months ago the flamboyant Italian trudged away from the World Cup meeting without a win from six starts as Godolphin drew a blank for a second consecutive year. This time around Dettori is confident of making a successful start with Two Step Salsa, who won last month’s six-furlong Etisalat Wasel Trophy on his seasonal debut. Last year’s Dubai World Cup runner-up Asiatic Boy was in action on the Tapeta training track at Nad Al Sheba on Tuesday morning. 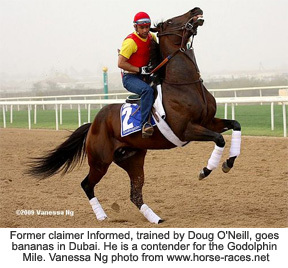 Second to Curlin in the US$6m race last year, having won the UAE Derby in 2007, the horse returns for a third run at the Dubai World Cup meeting. The five-year-old enters the race on the back of a victory in the Group 2 Maktoum Challenge Round 3, over the same 2000m dirt course and distance as the showpiece race under regular partner Johnny Murtagh. Trainer Mike De Kock said: “That was a big run last year and Curlin (the winner) was exceptional so we had to be happy with second. His second intended runner, Honour Devil will miss the race with a trapped epiglottis and will undergo surgery. Asiatic Boy will re-oppose Well Armed, who was a neck away in third. The American raider walked the shed row Tuesday following his half-mile work in :49.00 on Monday. He is scheduled to return to the track on Wednesday. Fellow American challenger, Anak Nakal galloped Tuesday over the main dirt track as he continues his preparations for the Emirates-sponsored contest. Saudi Arabian-based Neil Bruss has high hopes that his first runners in the UAE could win the sport’s biggest prize, the Dubai World Cup, sponsored by Emirates Airline. Zimbabwe-born Bruss only moved to the Middle East this season but the trainer – who is a familiar name in Africa – has enjoyed a fairytale start to his Saudi experience. Last month, he saddled Muller and Paris Perfect to finish first and second in the country’s most prestigious race, the King’s Cup, and now the duo line up for the UAE’s showpiece event, worth US$6m. ”I think they both have an equal chance,” said Bruss, who was champion trainer eight times in his homeland before moving to South Africa in 2003. “Paris Perfect won 10 of his 17 starts in South Africa and then won his first start in Saudi Arabia before running fourth in the prep race for the King’s Cup. “The mile and a half was probably too far for him when he was second in the King’s Cup, and he came around the field too, so it was a pretty good run all in all. Bruss is arguably best-known for his exploits with Zebra Crossing who won the J&B Met at Kenilworth in 2006. The horse was bred by his brother Robin and carried the green and white colours that originally belonged to his father Les. DESERT PARTY – FROM DESERT TO DERBY? GODOLPHIN’S Kentucky Derby hopeful DESERT PARTY (Street Cry) is the big favourite in the UAE DERBY and should he impress again, he will be headed to the Kentucky Derby. Kentucky Derby hopeful Desert Party has no excuse not to follow up his UAE 2000 Guineas win with victory in Saturday’s UAE Derby at Nad Al Sheba, according to trainer Saeed bin Suroor. The three-year-old son of Street Cry easily beat stablemate Regal Ransom last time out and, along with Godolphin Mile candidates Two Step Salsa and Gayego, is rated by Bin Suroor as his best chance of ending a two-year winless streak on World Cup night. “He (Desert Party) is a horse that reminds me of his dad, Street Cry,” said Bin Suroor. Gulfstream Park’s highlight race of the meeting and the last big Kentucky Derby prep in the south is Saturday’s Florida Derby at 9 furlongs. Strong Derby hopefuls like QUALITY ROAD and DUNKIRK will square off. The latter, a multi-million dollar yearling purchase who is unbeaten in 2 races is by Unbridled’s Song. 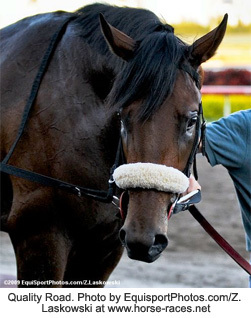 His trainer Todd Pletcher has never won the Kentucky Derby. Pletcher could run $2.3 million yearling purchase and maiden EUROPE (also by Unbridled’s Song) in the Florida Dervy as a rabbit for Dunkirk. MAGIC AL JACK, a British Columbia bred 4yo gelding, won his 3rd of his last 4 starts last night at Mountaineer for his red-hot owner/trainer BOBBY PION. The gelding, by Alfaari, won for $5,000 claiming for the 3rd time in those last 4 starts (the other race was a 68 length loss for $15K claiming). Magic Al Jack had won his maiden four starts ago by 23 lengths. HURRY HARD, owned by Rachelle Morden and trained by Lyle Morden, won a $5,000 claiming race at Mountaineer last evening as the odds-on favourite. The 7yo gelding is by Bold Executve out of Whose to Know. Multiple stakes winner STUCK IN TRAFFIC, who gave Queen’s Plate winner NOT BOURBON all he could handle last spring before he went on the sidelines, sizzled 4 furlongs on the Woodbine Polytrack yesterday morning in 47.60, the 6th fastest of the morning for the distance. Owned by Martha Gonzalez and MAD Racing and trained by Nick Gonzalez, Stuck in Traffic wintered at Dr. Lea Guitard’s farm north of Woodbine. MAD Racing’s champion runner WHOLELOTTABOURBON is also back as he worked the same distance in 48.20. He is a 7yo. Stakes winners DANCER’S BAJAN and SHADOWLESS were also on fire yesterday. The sprinters worked 5 furlongs in 59.40 and 59.00 respectively for trainers Robert Tiller and David Bell. The Bajan and Shadowless could join Legal Move and Main Executive in one of the early stakes events of the 2009 season which begins April 4.